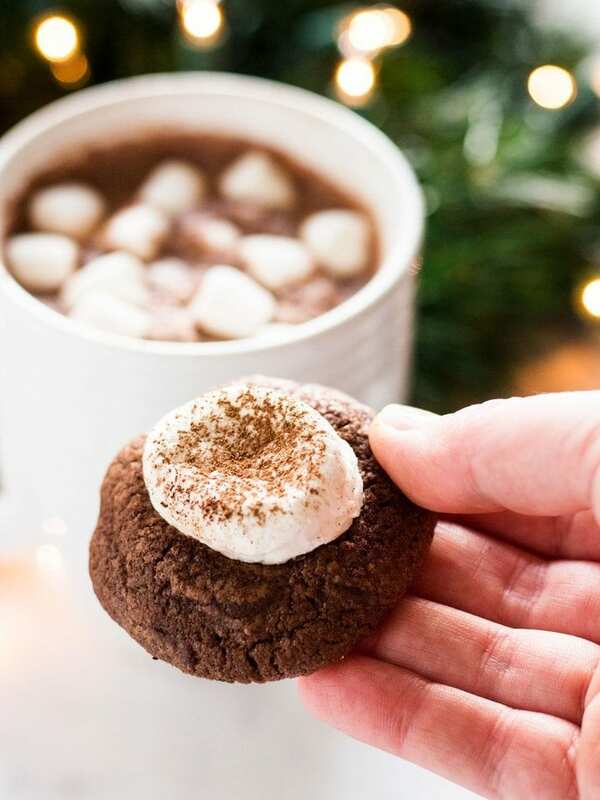 Hot cocoa cookies are warm chocolate cookies topped with gooey marshmallows toasted in the oven. They’re perfect for Christmas! Some of my favorite memories growing up are baking cookies with my family. I took hold of my nostalgia, put two and two together, and made hot cocoa cookies. Rich chocolatey flavor takes hold of your senses when biting into this cookie. Chocolate chips are melting away while cocoa takes up every bit of the dough holding it all together. A giant marshmallow topping the morsel is a gooey cloud of goodness. One of these cookies is a cup of hot cocoa in solid form, which in my opinion makes it all the more satisfying. The recipe is quite simple. I took the base for my double chocolate candy cane cookies, removed the peppermint bits and kept the cocoa flavor. The cookies on their own are chewy and chocolatey and with a couple additions they turn into hot cocoa cookies. I topped each cookie with a marshmallow and dusted them with cocoa powder. The cookies literally look like the top of a hot cocoa mug! As I’m writing this I’m realizing I have an obsession with hot cocoa recipes. And who wouldn’t? 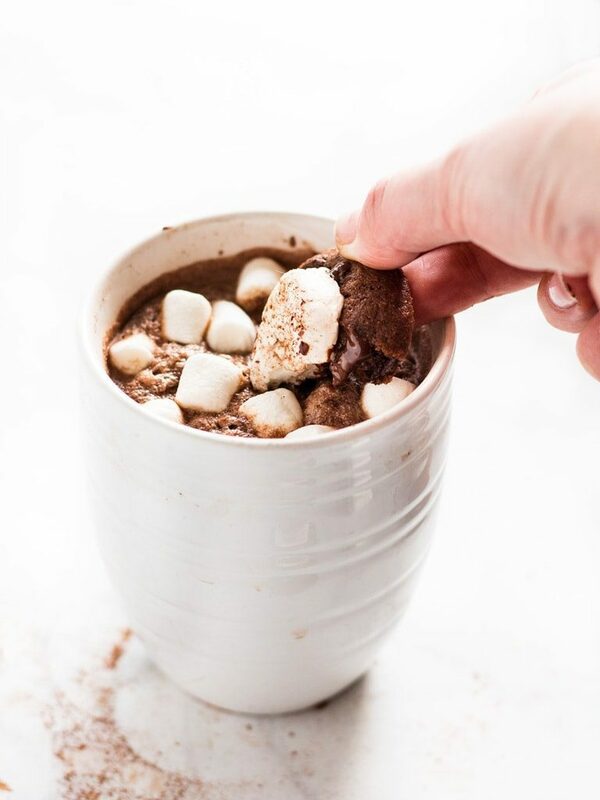 Chocolate and marshmallows creates a tasty combo. I’ve made hot cocoa brownies, another chocolatey confection with gooey marshmallows; hot chocolate truffles, which make a perfect gift for kids; and spiked hot chocolate cupcakes for the adults. 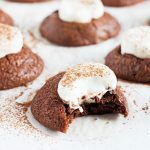 If you are a fan of cocoa recipes, then you will love these hot cocoa cookies. Curl up next to the fire with a plate of cookies and enjoy the winter season! Preheat the oven to 350 F and line a cookie sheet with parchment paper. In a medium bowl, whisk together the flour, cocoa, salt, baking powder, and espresso. Set aside. In a separate bowl with an electric mixer, combine the butter and sugar. Beat on medium-high speed for a 2 to 3 minutes, until light and fluffy. Add eggs one at a time, scraping down the bowl as needed. Add the cocoa-flour mixture to the bowl and mix on low speed just until incorporated. Using a wood spoon or rubber spatula, stir in the chocolate chips. Scoop a heaping tablespoon of dough, roll into a ball and place on the cookie sheet. Using the palm of your hand, slightly flatten the ball. Repeat with remaining dough placing the dough balls an inch from each other on the cookie sheet. Bake cookies for 12 minutes, or until the edges are set, but the center isn't fully baked. Remove the sheet from the oven and place a marshmallow half on each cookie. Return the cookies to the oven to bake for an additional 2 to 4 minutes, or until the marshmallows are melting and starting to brown. Let cool on the cookie sheets 5-10 minutes, then transfer to a wire rack to cool completely. So yummy! Thanks for linkin’ up with What’s Cookin’ Wednesday!